Comprehensive energy strategies focus not just on minimizing usage, but on offsetting energy needs with renewable sources. Reducing energy and achieving “net zero” has long been a clarion call of the green building movement. The path to net zero often focuses on two key strategies: energy reduction and energy creation. Recently, energy procurement from renewable sources is also becoming a major part of these discussions. Energy reduction strategies push buildings to take advantage of locations and forms that minimize material usage and optimize performance. This tactic, when paired with sustainable technologies like high performance facades and efficient systems, significantly reduces operational energy usage. Minimizing the energy a building needs is a key first step--and the place where design often has the greatest potential for impact. In a traditional net zero approach, the amount of energy a building needs is then created on-site via renewable energy sources from photovoltaic panels to geothermal or wind energy. This two-pronged approach to net zero is an accessible path for buildings located in environments where renewable technologies yield significant amounts of energy production and offer a high return on investment. 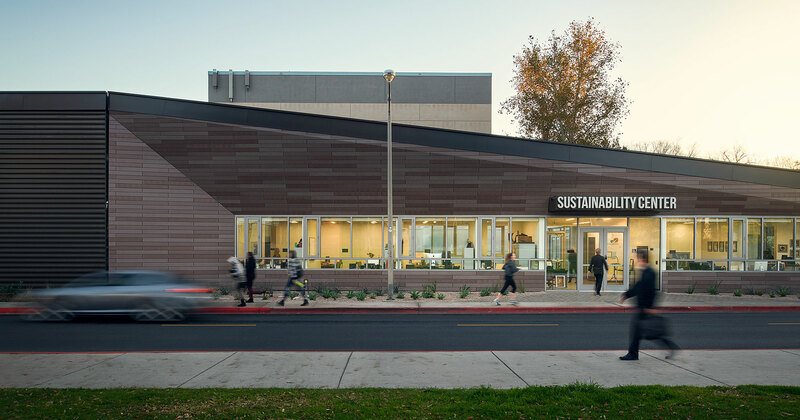 California State University, Northridge’s (CSUN) new Sustainability Center leverages a range of sustainable strategies to set a new benchmark for sustainable design in higher education; it’s the first completed Zero Net Energy building in the CSU system. The conversation around net zero is quickly shifting, however, to include the procurement of renewable energy from utilities in markets where buyers can specify their energy source. This strategy becomes increasingly viable as energy grids begin to accommodate and offer more renewable options. The added approach of procuring energy that can’t be minimized or generated is a crucial strategy for minimizing impact when on-site renewables can’t meet energy demand. The path to net zero often focuses on two key strategies: energy reduction and energy creation…Minimizing the energy a building needs is a key first step — and the place where design often has the greatest potential for impact. While this option is only available in select markets today, an increase in market demand for renewables from the grid can incentivize greater future investment. Such demand can also foster a larger dialogue around the role utilities and smart energy grids can play in minimizing the impact of the built environment. 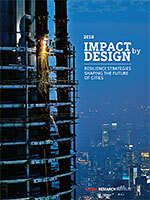 In Impact by Design 2018 we introduce Strategies for Positive Impact: a collection of six major areas that have the greatest potential for positive climate impact in the coming years.